Samsung announces its latest flagship phones, the Galaxy S8 and Galaxy S8+. Both phones sport what Samsung brands as an Infinity Display - a curved flexible Super AMOLED that is almost without any bezels. Samsung did not release an edition with a non-flexible rigid OLED, but this isn't really a surprise. The Galaxy S8 has a 5.8" Quad HD+ (2960x1440, 570PPI) OLED while the S8+ has a larger version (6.2") but with the same resolution (529 PPI). 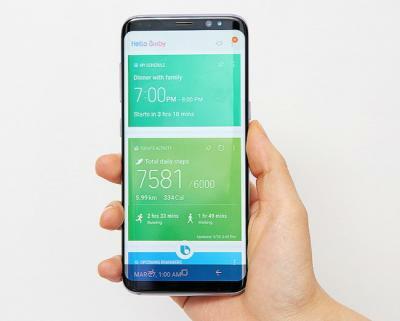 Both phones feature a 10nm Octa-core 64bit CPU, 4GB of RAM, 64GB of storage, microSD slot, IP68 water and dust resistance, Android 7.0, Samsung Bixby assistant and a Dual-Pixel 12MP OIS camera. Both phones will launch globally on April 21st 2017.